This mocha whipped cream is all of the best parts of your favorite expensive coffee drinks in whipped cream form. In fact, I think there is more coffee flavor in this whipped cream than there is in a mocha and one of those places! You will be amazed how much coffee and chocolate punch this packs while still being a light and fluffy whipped cream. As much as I love frosting, it isn't a big leap to assume I love whipped cream too. And I do! For the longest time I thought there was only kind of whipped cream.... whipped cream! A little vanilla a tiny bit of sugar and you are in business. Then my eyes were opened to a whole new world. MiMi made maple whipped cream for her pumpkin slab pie. I made a cocoa whipped cream for a delicious pavlova. I even made horseradish whipped cream for our prime rib feast on New Year's. But this version has the most flavor yet! It is bursting with coffee and chocolate flavors. It isn't overly sweet, but you could certainly increase the sugar some if you'd like it a bit sweeter. You are just going to have to try it to believe it! In a microwave safe bowl, melt the chocolate until it is smooth. Start with a 30 second burst, then stir. Microwave in 15 second bursts after that, stirring after each one until just melted and smooth. Stir together 1 T hot water and 1 T instant coffee. Stir into melted chocolate until smooth and allow to cool to room temperature. If you have the space, place your mixer bowl and beater in the refrigerator to chill. (It's not necessary, but does help the cream whip easier.) Whip cream, vanilla and sugar until it just begins to form soft peaks. With the mixer blade going, add the chocolate/coffee mixture to the bowl. Whip until you reach your desired consistency. I'll take a bowl of this and a spoon please! I know, right?! I totally make this when nobody else is around so the beater and bowl are mine! Oh yum! This sounds sinful. I'm all about the mocha! It is definitely sinful and sooo good! This sounds like my type of frosting! I can just imagine it on a chocolate cupcake, yum! Mine too, fluffy and full of flavor! It would be perfect on a chocolate cupcake! This recipe is awful. If you add water to Chocolate the chocolate seizes. While you do have to be careful when doing a water bath etc. you can in fact add water to chocolate. There are actually recipes making "chocolate mousse" using only chocolate and water. I've also seen a Swiss method of making mousse that starts with melting chocolate with water from a tea kettle. I'm sure there are a lots chemical reasons for why some things work and others don't. I just know this has worked for me every time I've done it. We make mocha every morning. Grind the coffee beans then add to french press with hot water. While this is extracting with add 70+% fine quality combination chocolate nibs and disks to a large glass measuring bowl, then add boiling water and stir well with hand whisker to melt all the chocolate, in 2 years of doing this the chocolate has never "seized", always comes out velvety smooth. Then combine chocolate and coffee mixtures in a milk frother for the yummiest mocha ever. 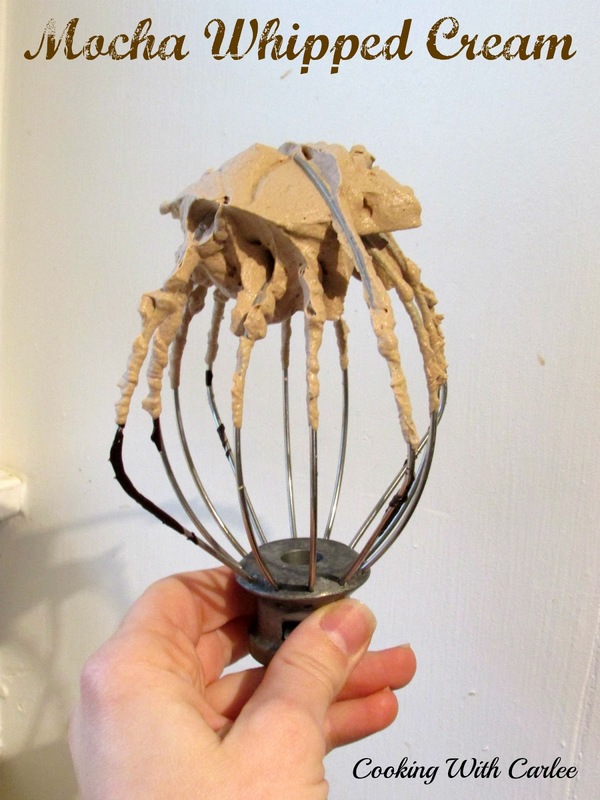 After reading your recipe I will reserve some of my mocha mixture to add to my home made basic whipped cream whip cream. Sounds divine. Thanks for sharing.